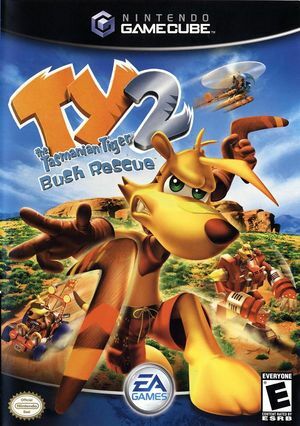 The tiger returns to take back the Outback in Ty the Tasmanian Tiger 2: Bush Rescue. The evil Boss Cass has broken out of Currawong Jail and has hatched a plan to take over the world with an army of Uber Reptiles. Now it's up to Ty, the boomerang-wielding hero, and his newly formed team of Burramudgee Bush Rescue mates to stop him. As Ty, you can explore an expansive open environment on foot or in a vehicle. You'll also have access to more boomerangs and mech units, each with special powers and abilities. Ty the Tasmanian Tiger 2: Bush Rescue has a native 16:9 display option, but it requires enabling it in its internal options and setting Dolphin's Aspect Ratio graphics setting to "Force 16:9". Using the widescreen hack with this title is not recommended. 16:9 Game has built in widescreen support, needs to be stretched to work. The graph below charts the compatibility with Ty the Tasmanian Tiger 2: Bush Rescue since Dolphin's 2.0 release, listing revisions only where a compatibility change occurred. This page was last edited on 18 March 2019, at 08:22.